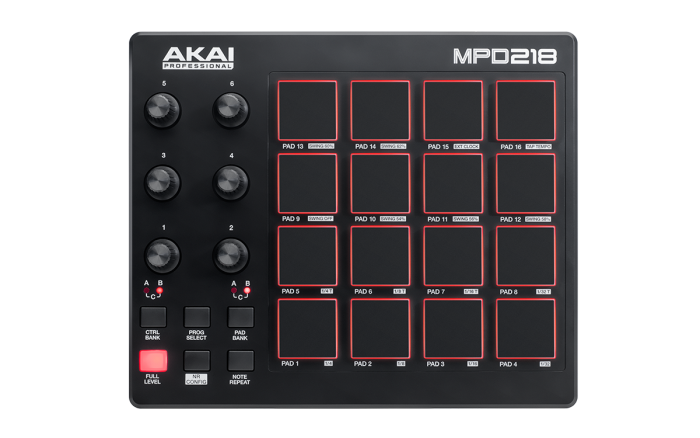 The MPD218's pads are designed to be very sensitive to allow for the creation of detailed and nuanced performances. As a result, it is not necessary to use a great deal of force on the pads when performing. Because the MPD's pads are sensitive enough to detect a very slight input pressure, it is not necessary to very forcefully strike the pad to generate a MIDI note with high velocity. If you do want to consistantly generate MIDI notes at maximum velocity, use the MPD's Full Level button. Full Level will generate a MIDI event with maximum velocity (127) regardless of how hard or softly you hit them. With pad sensitivity in mind, it is not advised to rest your finger or hand on the pads as the slight pressure of a finger resting on the MPD's pad can easily trigger a MIDI note. Resting on a pad can be an unconscious action so if you find that you're double triggering notes, ensure that you are not unintentionally leaning on a pad after striking it. Like the frame of an electronic drum kit in relation to the connected drum pads, the MPD's enclosure is ultimately in contact with its trigger sensors under the pads. As a result of this contact between the enclosure and the pads, in extreme cases, unintentional triggering can be caused by vibrations moving through the surface on which the MPD is resting. More forceful playing willl cause both the hardware and surface to move more and allow for a greater chance of an unintentional trigger. The MPD's rubber feet will absorb most vibrations coming back to the MPD's sensors but depending on the surface on which the MPD is sitting, it can pick up latent vibrations. Put the MPD on a solid surface when you are performing. If the play surface is unsteady or bouncy, you’re more likely to experience undesirable play characteristics such as over-sensitivity (double triggers), or under-sensitivity (missed notes). In addition to the above recommendations, there are ways to filter MIDI events at the software level. The MPD218 includes the Ableton Live 9 Lite software so for the purposes of this demonstration we will use that software. If you are using a different DAW, check with the software developer for more information about filtering MIDI values. Different types of MIDI effects can be added to MIDI tracks in your Live Set. In the example below, we will be working with a drum kit, Kit-Core 909, as our instrument. In the MIDI Effects category of Ableton, select Velocity and add that to the Rack on the MIDI track. In Velocity's parameters, select Gate - this parameter will allow you to choose which note velocities will register within the software in a given range. Under the Range/Lowest fields, enter the highest and lowest possible MIDI values. The example below shows a range of 40 to 127 - in other words, only MIDI events with a minimum velocity of 40 will trigger the instrument. Using this gate can be useful when you are blocking MIDI events with low velocities, such as those seen in double triggers. The lowest value can be tailored to accomodate your own specific needs and application. Whether you are a customer or dealer, if you already own an Akai Pro product, or if you jsut have pre-sales questions, the Akai Pro technical support team is available to help! Visit the link below to connect with any of the following support options: Online community support, phone support, email support.